A hazardous substance is one that, upon exposure, can have an adverse effect on health worker health. These include poisons, substances that cause burns or skin and eye irritation, and substances that may cause cancer. 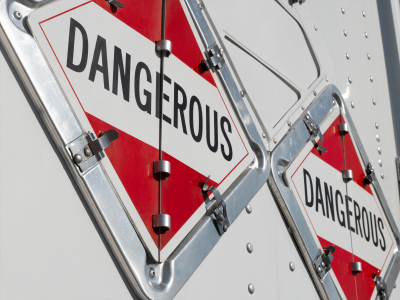 Dangerous goods are substances, mixtures or articles that, because of their physical, chemical or acute toxicity, present an immediate hazard to those who come in contact with them, property or the environment. These include chemically reactive or highly toxic substances, explosives, corrosives and flammable liquids and gases. Many hazardous substances are also classified as dangerous goods. A substance is a hazardous substance if it meets the classification criteria specified in the Approved Criteria for Classifying Hazardous Substances [NOHSC:1008(2004)]. A substance is a dangerous good if it meets the criteria contained in the Australian Code for the Transport of Dangerous Goods by Road and Rail (ADG Code). The ADG Code contains a list of substances classified as dangerous goods. The harmonised Work Health and Safety (WHS) legislation through the new WHS Regulations covers workplace hazardous substances and dangerous goods and promulgate, a hazard classification and hazard communication system based on the United Nations’ Globally Harmonised System of Classification and Labelling of Chemicals (GHS). Jurisdiction specific workplace dangerous goods storage laws also capture combustible liquids, which are classified according to the Australian Standard AS1940 (The Storage and Handling of Flammable and Combustible Liquids). Our team of experienced occupational hygienists and dangerous goods consultants will provide advice on hazardous substance and dangerous goods use storage handling and transport for compliance with the relevant codes, standards and regulations. Our services include: safety data sheet review; risk assessment review and preparation; training arrangements and requirements; handling procedures; storage compliance (design, layout, separation, hazardous area classification, etc. ); site emergency plans; dangerous goods manifest/notification and dangerous goods registers.